Sagal is a single mother of two school-age children. Together, they make their home in south Seattle. 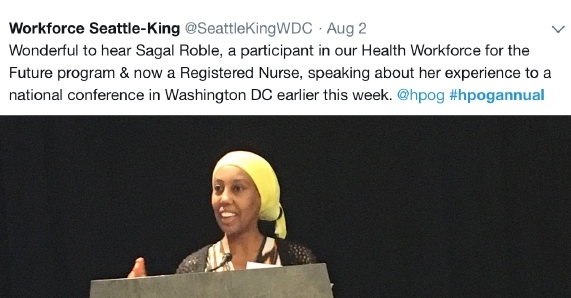 In 2013, when Sagal arrived in Seattle, she sought assistance from her local welfare office where her caseworker connected her with cash assistance and told her about the Health Careers for All program. With an interest in healthcare, Sagal enrolled and joined a training cohort at South Seattle College to prepare for and enter nursing. To put food on the table, she also began part-time work doing remote medical interpretation from home, earning $500 monthly to help support her family, and moved off cash assistance. She completed all of nursing’s pre-requisite courses with competitive marks, moving on to the next step—the licensed practical nursing (LPN) program. Throughout the intensive LPN program, Sagal says she benefited from the support of students and her “navigator” (career counselor), and in spring 2015 she successfully completed the program. That September, after passing the national credentialing exam and earning her state license, Sagal began full-time work as an LPN in a local rehabilitation center, earning $27 an hour. Sagal’s drive to become a nurse wasn’t yet satisfied—she stayed in close contact with her navigator and enrolled in the Health Workforce for the Future program in 2016 and was accepted into the LPN-to-RN ladder program at Highline College shortly after. She graduated with her associates degree in nursing (ADN) and secured a full-time registered nurse position at $39/hour in September 2017. Sagal plans to continue her journey, with a final career goal of becoming an advanced registered nurse practitioner (ARNP). The reasons I would like to become a registered nurse are many ... I would love to motivate others who are in the same shoes as I was some years ago. I want to make them understand that hard work pays off, and to persevere and believe. I have always been a good student and have been able to achieve the goals that I set for myself. My children look up to me as a role model, and their grades at school reflect that. I want to be an exemplary person for my children so that they too can achieve their goals. We congratulate Sagal and the hundreds of individuals who have dedicated their lives to our healthcare while building a prosperous future for themselves and their families.